September 29, 2017 — I was surrounded by hordes of 19-year-olds dressed in bright orange and white. Their youth was brazen with their tan legs and fresh faces, and they spoke in accents that placed them far below the Mason-Dixon. I stroked the scraggily beard on my pale, craggy face, feeling my age, and hunkered deeper into my dark cardigan. I just wanted to find a centaur skeleton. I was braving the sunny campus of the University of Tennessee in Knoxville, slipping through alleys and over walking bridges trying to find the shortest distance between my parking garage and the John C. Hodges Library. Because it had a centaur skeleton. Did I mention that? I found it easily, on the first floor of the library, in the Jack E Reese Galleria, but only because I was looking for it. 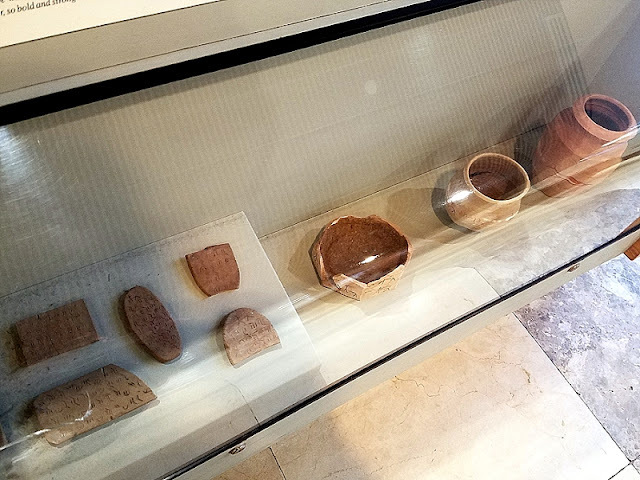 Otherwise, the simple, elegant archeological display was almost unnoticeable in the large, almost empty gallery. Let me rephrase that. 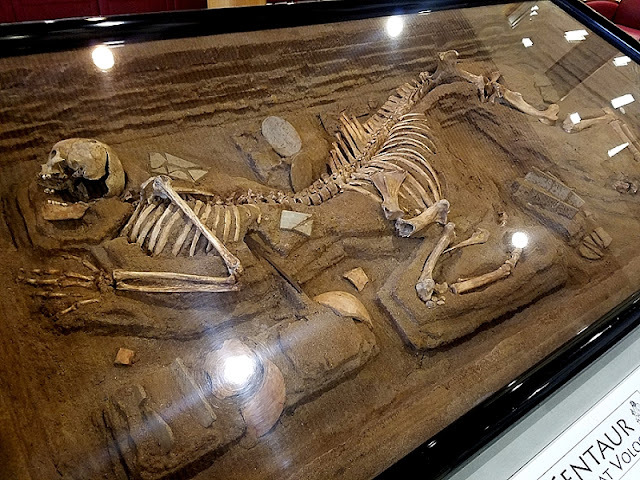 A full-sized centaur skeleton was almost unnoticeable. Like it was a subtle joke placed by a wannabe Banksy. The exhibit was of a half-excavated horse-man skeleton in a death pose, like you’d see at a natural history museum for one of the smaller dinosaurs. Embedded around it were shards of ceramic pottery. On the other side of the display were more shards of pottery, each one bearing distinct shapes reminiscent of the hooved humans. 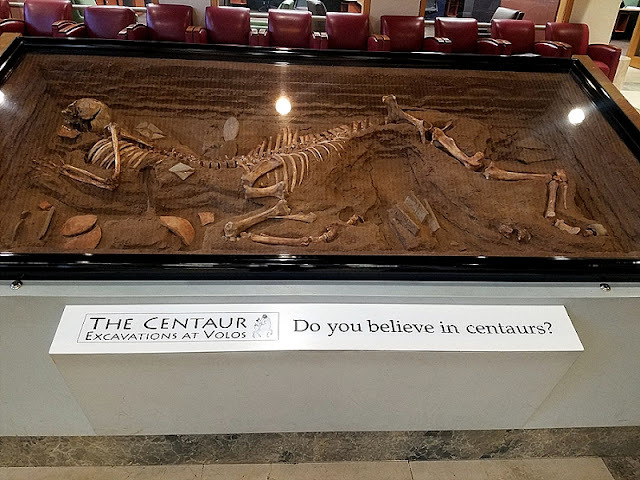 A placard explained the history of centaurs, their culture, and how this skeleton was one of three that had been pulled from the muck near Volos, Greece, causing historians and biologists and LARPers to rethink the mythical status of the creature. Now we’re to the part of the article that I hate, where I have to start talking about it as the art installation it is instead of as the centaur skeleton it isn’t. The piece is called The Centaur Excavations at Volos and was created in 1980 by Bill Willers, a biology professor and artist at the University of Wisconsin-Oshkosh. He built it with the real bones of a Shetland pony and an old human skeleton from India that was hanging somewhere in the college’s biology department. 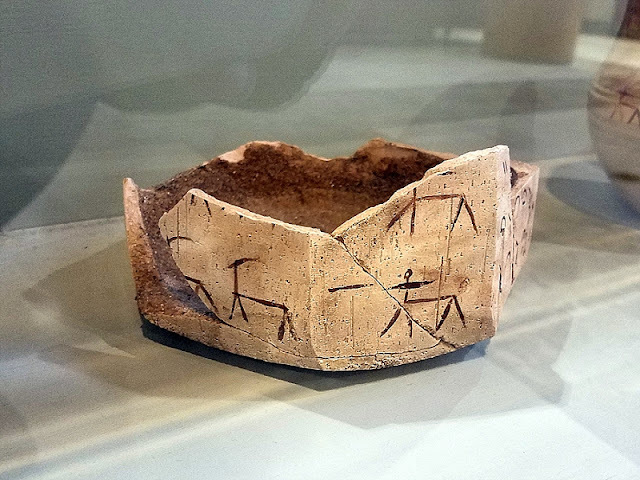 He stained the bones with tea to give them an ancient appearance, and then created a mythology around it with the pottery. And, honestly, knowing that these are real bones helps mitigate my sentiment in the first sentence of this paragraph. Willers the Centaur Maker toured the piece around to various college galleries in the 1980s before storing the piece in a barn, where I assume it confused a lot of horses. In the early nineties, interested parties at the University of Tennessee decided they wanted to purchase it for permanent display on campus. I’m not sure why. I assume just because it was cool. That’s why I would do it. Even if I had to fend off questions like, “What would the tax payers of Tennessee think if we purchased a centaur?” According to the professor responsible for bringing it to the university, that exact question was raised. I love the world sometimes. 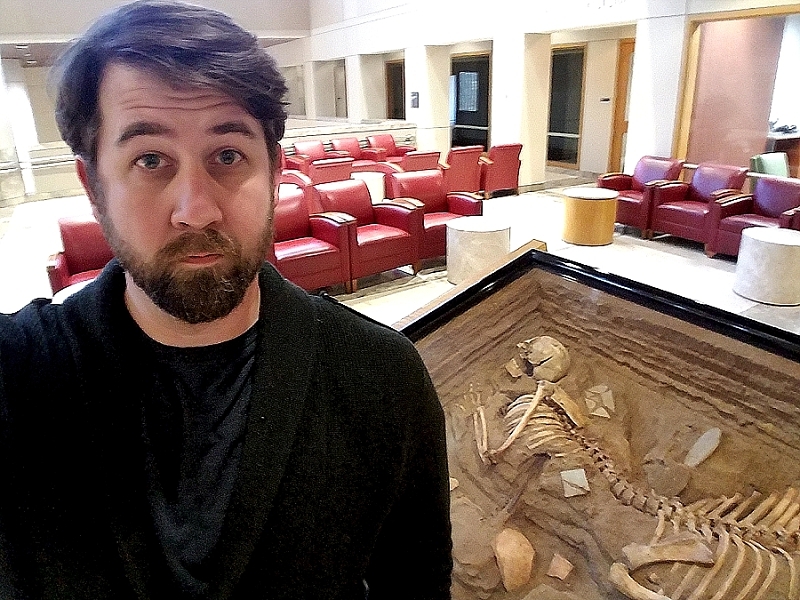 You don’t really need a moral behind a centaur skeleton, but the ones used for this bony art piece include teaching collegians the importance of skepticism and exploring the lines slashing through science, art, and history. 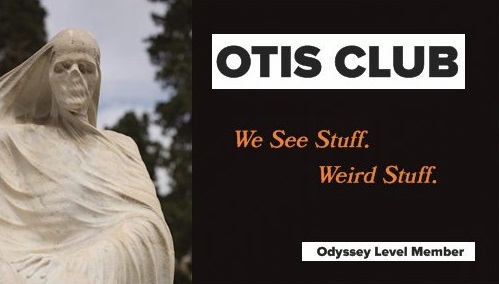 It’s a lot like the Cardiff Giant, in a way, I guess. Except not as mean-spirited. Coincidentally enough, the sports teams for the University of Tennessee are called the Volunteers, which is often shorted to Vols, which is only one letter away from Volos. That means that hopefully one day the university will retire their mascot Smokey the blue tick hound for a majestic centaur and really increase the value of their merchandise license. They can still keep it all orange and white. Not surprisingly, this isn’t Willers only centaur skeleton. Right now, there is one on display at the Barnum Museum in Bridgeport, Connecticut. This one isn’t embedded in dirt, but stands fully erect…or fully L-shaped, I guess, and features the bones of a zebra and a human this time. Yes, it’s on my list. As I left the campus, I didn’t feel so out of place anymore. I mean, I still didn’t make eye contact with any of the kids, but I definitely think I belong at any place with a centaur skeleton.